Adjunct clarinet professor Tim Haas (second from right) talks to Andre House core staff member Ana Chavez before the Clarinet Studio’s performance. You don’t need to bring joy to the world, at least not in its entirety. But you can bring moments of happiness to a little part of it. 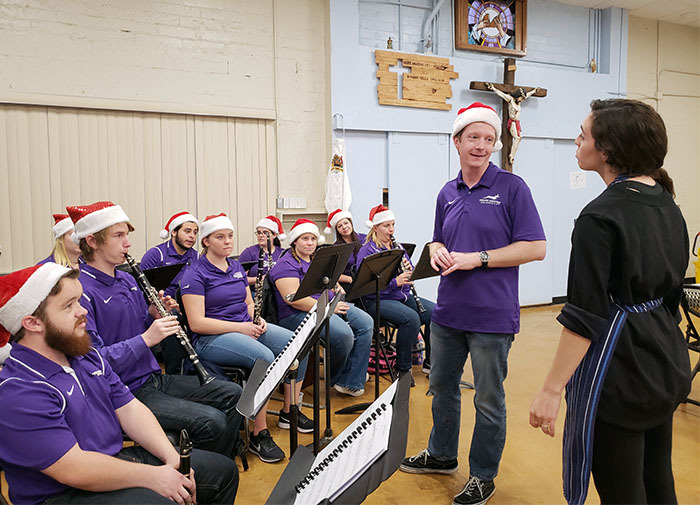 Grand Canyon University’s Clarinet Studio did just that Sunday evening during dinner service at Andre House of Arizona, a Catholic charity that serves about 550 meals a day to Phoenix’s poor and homeless populations, though some days that number can reach 750 meals served. As the sun starts to wane, across the gated campus from St. Vincent de Paul and its Urban Farm, a white truck sputters slowly down the street. A woman driving asks a man outside Andre House, one of dozens of people gathering there, if he would like a sandwich — a prelude to the 5:30 p.m. dinner service inside. Clarinetists Bryan Toll (front row left) and Jonathan Smith (front row right) perform during the dinner service Sunday evening at Andre House. It’s where the Clarinet Studio, an ensemble of GCU musicians, most from the University’s Pep Band (though some are alumni), have filled one corner of the dinner room under a portrait of St. Andre Bessette with the words “Pray for Us.” Their music stands are up. Their purple shirts — and red Santa hats and reindeer antler headbands — are on. Their sheet music is out. They’re ready to go. “I remember the last time you played for us. It was back in April. It was my birthday. You played ‘Happy Birthday,’” Andre House core staff member Ana Chavez said with a smile to Tim Haas, the adjunct professor of clarinet who helms the Clarinet Studio. As dinner guests started to stream in, carrying trays of fried chicken and steamed broccoli, the group launched into “Dance of the Reed Flutes” from The Nutcracker Suite, “Away in a Manger,” “Good King Wenceslas,” “Christ Was Born on Christmas Day” and other familiar Christmas tunes. This is the second time the Clarinet Studio has played for Andre House. Hernandez said the clarinet ensemble is unique; not many all-clarinet ensembles perform in the community. 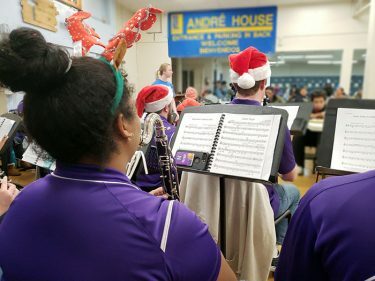 The group has played, not only at Andre House, but at Merriment on Melrose, a community outreach event and fundraiser for school music programs. The 15 members of GCU’s Clarinet Studio volunteer their time at various community events. Chavez said it’s not often that musical groups perform at Andre House, though sometimes on Saturdays a custodian will DJ. “He calls it his Holy Boom-Boom,” she said with a laugh. 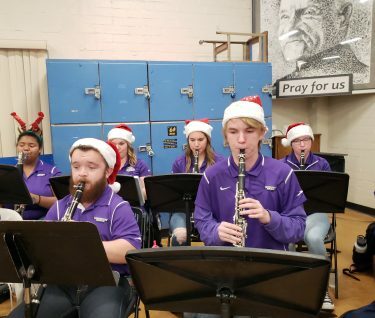 Longtime Andre House volunteer Father Duane Balcerski said he wasn’t so sure how well a clarinet ensemble would sound among the busyness going on in the dining room. He himself played clarinet in high school and knows how squeaky the instrument can be. Clarinetist Bryan Toll, who graduated from GCU in 2017, didn’t hesitate to heed Haas’ call to play on Sunday. “I just love sharing our spirit with the people here and giving them that joy,” he said. Even as volunteers from Intel, dressed in their blue T-shirts, were wiping down tables during the dinnertime wind-down, the clarinetists still played — and even took in a request from Chavez to perform “Happy Birthday” one more time for one of the core staff members. 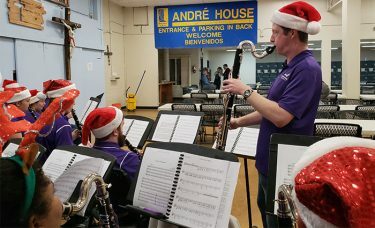 Haas said Sunday’s performance was the Clarinet Studio’s second at Andre House, which serves some of Phoenix’s neediest populations. Haas is proud of the musicians in the group, who often show up for rehearsals as late as 8:30 p.m. — sometimes the only time musicians are able to meet, considering their busy schedules.